I know many of you will be taking fancy vacations this season with trips around the country, or even to Europe or some fabulous island locale. While I sadly can’t join in on that fun this year, I have (re)discovered a place that instantly calms and soothes, gets me out into the world, and reminds me that it’s summer. I live in Park Slope, Brooklyn, a third of a block away from Prospect Park—designed by Olmstead and Vaux, who also designed Central Park in Manhattan but considered Prospect Park their masterpiece. I also live on one of the busiest streets in Park Slope so for people-watching my stoop rivals the sidewalk cafés in Paris and that is not an exaggeration. That is how many people will pass by in the warmer months. I planted these red pansies in memory of L’Wren Scott. The brownstone I live in was built in the late 1800s and it looks it, which is both good and bad. Sometimes I feel like I live in something out of a Virginia Woolf or Edith Wharton novel—Victorian and grand and old New York. Sometimes I feel like these old places aren’t worth the trouble since something is always, always falling apart. We share the brownstone with another family and so live on the top floor. My neighbor gets the backyard. We get the stoop. I can tell you this—we got the better deal. The stoop is a magical place. The boxes outside my door are filled with pansies. The red I planted this spring in memory of L’Wren Scott, who loved those deep velvety reds. I know peonies were her favorite flower (mine too) but I think she would’ve loved the intense red color of these pansies. The flowerboxes make it easy to stash a wine glass behind them in the evening. People have been ticketed for drinking on their own stoop, can you believe that? Neighbors walk by and that’s how you get to know everybody on your side of the street—the relaxed and easy conversations that come from the relaxed and easy pace of the stoop in summertime. My kids hula hoop, ride on scooters, draw with chalk, play with toy city buses, all in my sight. It’s a relaxing place for them too. Nothing says old school Brooklyn like kids playing on the sidewalk in the shadow of a brownstone. Is it 2014 or 1940? The view often includes a tacky car parked out front, such as this one. And sometimes a lucky view: Vintage BMW (love) and my scooter-riding son (also love). Speaking of old school, check out this vintage BMW that parked literally in front of my house the other day. It’s the color of butternut squash and I wasn’t the only one taking pictures of this beauty! It’s pictured here with my son in front of it. I wish you all a bon voyage on your lovely vacations. As for me, I will be spending a lot of time this summer on my stoop. Wish you were here! I too will be staying at home, but I live in a heavily wooded small suburban area with a lake and walking path, 10 miles out of downtown Minneapolis. I am an urban girl at heart, but this haven so close to the city is perfect. I LOVE your stoop. I LOVE your area. But oh dear, you need to post pics of the inside of your home. Please????????????? Oh, people watching is the best! I would love to sit on your stoop and watch the parade! Quintessential NYC. And I bet stoop is pronounced schtoop...right? Very nice and you do have quite the view with Prospect Park. Sitting on the front stoop evokes different visions in Chicago as it is only done in the less genteel neighborhoods. The police call them porch parties. Guests often leave in paddy wagons...or by ambulance. Looks like the ideal place to watch the world go by. I love your flower boxes and your doorway. I too would love a peep inside your house one day because the entrance is fabulous! perfect for people watching, a favorite occupation! thanks for yet another terrific post. During my teenage years, I lived in Flatbush Brooklyn. 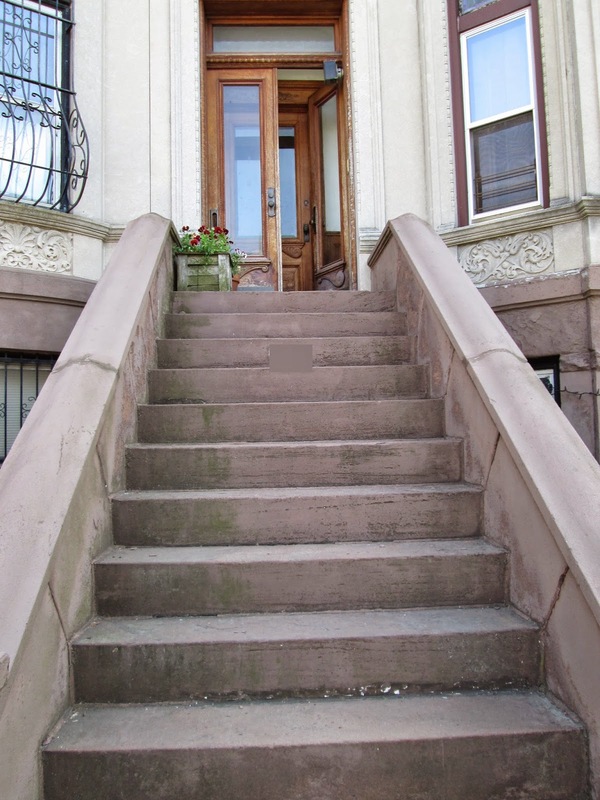 I spent many summers on my best friend's Park Sloop Brownstone Stoop. We loved watching the world go by and making new friends. It was beyond wonderful. We never got bored. On rainy days we went to the Srand Movie Theatre nearby. Some days we just walked a short distance to Prospect Park. There was horse-back riding, tennis. We stayed in Prospect Park in an Airbnb when we went on our last NY trip and loved it!!! We loved the little place Gueros to eat tacos and drink margaritas... So yum! I can't believe people have gotten tickets for drinking on their own stoop! Oh my, I am jealous of your stoop! I live in a perfectly nice subdivision, with a nice porch, but literally nothing to look at. Neighbors drive into their driveway, open their garage door with their opener in the car and disappear into their homes. Nothing to see. Hi Joanne, thank you for your nice comments. I don't think I'm brave enough to show the inside of my place, it seems like it's such a mess most of the time and there are Legos everywhere!